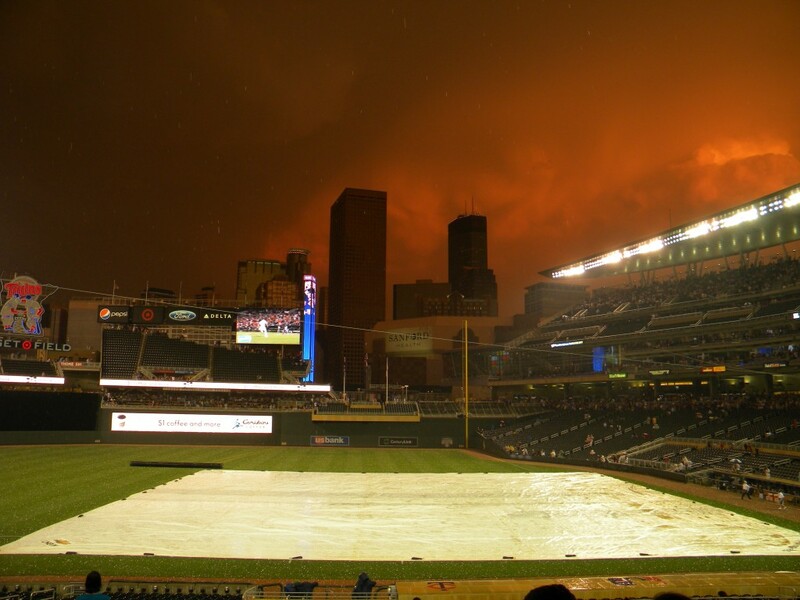 The Twins 2011 season has been awful and so has some of the weather at the games. During the 2010 season only one game was postponed due to inclimate weather. This season there has already been at least 2 (lazy) and even when games have been played, the weather has been frightful for the most part. However, frightful weather conditions sometimes can produce interesting conditions for weather nerds. There was already a game this season when it was snowing during much of the game. A couple weeks later it was hot and humid with a severe thunderstorm and hail. On May 12th, the weather around the metro area was very unsettled with severe thunderstorms popping up allover. The rain started falling harder and harder until the tarp was finally brought out. A couple minutes later, hail the size of golf balls started falling. So much hail fell that the game had to be delayed a little longer than usual so the grounds crew could round of the ice chunks and melt them down. It was a bizarre scene to say the least but then again, this season has been pretty bizarre itself.